Cuadra San Jorge’s star filly Jala Jala, upset winner of the Clasico del Caribe in spectacular fashion a year ago at Gulfstream Park, returns to South Florida for a chance at making history in Saturday’s $100,000 Copa Confraternidad. The 1 ¼-mile Copa Confraternidad for 3-year-olds and up on the main track is one of five stakes worth more than $700,000 in purses as part of the Clasico Internacional del Caribe, Latin America and the Caribbean’s premier Thoroughbred event being hosted by Gulfstream for the second consecutive year. In 2017, Gulfstream became the first pari-mutuel facility outside Latin America or the Caribbean to host the Clasico Internacional del Caribe since its inception in 1966. This year’s main event, the $300,000 Clasico del Caribe for 3-year-olds, will see Jala Jala’s undefeated stablemate Kukulkan go after his 14th consecutive victory. A victory on Saturday would make Jala Jala the first filly to win the Clasico’s premier race for both sophomores and older horses. Panamanian colt El Tigre Mono won the Clasico in 2016 and the Copa Confraternidad in 2017. Gutierrez recalled the excitement of last year’s Clasico, when he also ran third with the forwardly placed Joyme. As the field entered the stretch, Jala Jala had rallied from far back on the outside to take the lead with Joyme second, separated by five lengths. As with last year’s Clasico del Caribe, Jala Jala will be facing males again in the Copa Confraternidad while stretching out another eighth of a mile. Though she has never gone 1 ¼ miles previously, each of her past two races have come at 1 3/16 miles. Irad Ortiz Jr., locked in a duel with younger brother, Jose, for the 2018 Eclipse Award as North America’s top jockey, will have the mount once again on Jala Jala from Post 2 in the field of nine. The elder Ortiz won three Clasico races last year, the other two going to Hall of Fame countryman John Velazquez. Jala Jala will be up against some familiar competition in the Copa Confraternidad in Panama’s Fray Angelico, Puerto Rico’s Justiciero and Mexico’s Inspirato, who ran second, fifth and seventh, respectively, in last year’s Clasico del Caribe. A 4-year-old son of multiple graded-stakes winning millionaire Concerto trained by Alberto ‘Droopy’ Paz Rodriguez, Fray Angelico has won five of his nine starts this year including each of his last two, an allowance and the Clasico Raul Espinosa Gold Cup (G2) 13 days apart, the latter on Oct. 28. “He’s mature. He’s grown. A mile and a quarter he handled beautifully. He got beat badly by Jala Jala. I don’t know if she’s in top form also, but he’s in top form. If she’s not in top form, we can give her a fight,” said Rodriguez, who owns more than 6,400 career victories. 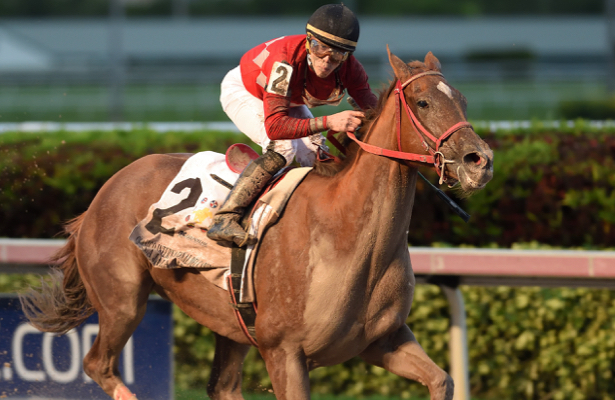 Fifth last year, Panamanian-bred 5-year-old Dynamo is the lone returning horse from last year’s Copa Confraternidad. He enters the race with three consecutive runner-up efforts, the most recent coming to Fray Angelico in the Clasico Raul Espinosa Gold Cup. In addition to Justiciero, Puerto Rico is also represented by Bold Master and champion Exclusivo, L.A.R. Stable Corp.’s Exclusivo, by Grade 1 winner Warrior’s Reward, began his career in the U.S. in 2015 and after two races returned to his native country where he has reeled off 15 consecutive wins. Justiciero and Bold Master have been under the care of Gulfstream-based trainer Victor Barboza Jr. Justiciero swept Puerto Rico’s Triple Crown in 2017 and was second choice in last year’s Clasico del Caribe, where he raced near the back of the pack early before rallying to finish a neck away from fourth. Also entered are Venezuela’s multiple Group 2 winner Black Widow and Mexico’s Group 1-placed Mr. Jerry.